Patriotism is alive and well on Cape Cod, evidenced by the abundance of Independence Day Celebrations with parades and fireworks demonstrations throughout the area. This is Americana at its’ small town best. From Sandwich to Provincetown and on the islands of Nantucket and Martha’s Vineyard, flags will fly and folks with gather along sidewalks to watch parades and on beaches to view fireworks. Some lucky folks will be enjoying fireworks exhibitions from boats afloat on rivers and bays. Whether you are a native, a wash-ashore, or a vacationer, what a wonderful time to be on Cape Cod. As the 4th falls on a Sunday this year, some villages and towns on the Cape have opted to have their celebrations on varying days from July 1st to July 5th. Here are dates and times various villages and towns have scheduled their events. Osterville will hold their parade on Friday, July 2nd at 11:00 am starting on Webster Street, continuing onto Sea View Avenue and then onto Warren Street. Chatham, Centerville, and Orleans will hold their parades on Saturday, July 3rd. With the theme “From Sea to Shining Sea,” the Chatham parade will began at 9:30 am on Main Street. The Independence Day Celebration on Nantucket starts at 10:00 am and features a dunk tank, face painting, watermelon and pie eating contests, and a puppet show. The Town Firefighters, with the old hand pumper, will square off in water fight with the Volunteer Firemen on the Flint Ranney Antique Fire truck. Fireworks will begin at 9:00 pm and the best viewing will be off Jetties Beach. Shuttle service to the beach is encouraged. Holding their parades and events on Sunday, July 4th will be Barnstable Village, Bourne, Falmouth, Provincetown, Cotuit, Sandwich, and Edgartown on Martha’s Vineyard. The parade in Barnstable Village, featuring the Barnstable High School Marching Band, will start at 9:30 am on Railroad Avenue, proceed down Route 6A and onto Mill Way to Village Hollow where additional activities and celebrations will be held. The Town of Falmouth really rocks with a Bike and Carriage Parade. Families dress in creative Uncle Sam costumes and join the parade. 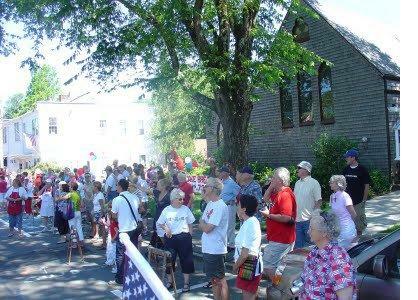 Beginning on the Falmouth Village Green at 10:00 am, they stroll down Main Street to Margaret E. Noonan Park where a patriotic sing-along commences. There will be a fireworks celebration at 8:40 pm at Falmouth Heights Beach on Vineyard Sound which can be viewed from several locations in Falmouth. The 4th of July Parade in Edgartown on Martha’s Vineyard is a long-standing tradition. Kilt-clad bagpipers, veterans, floats, fire trucks, and animals parade through downtown. The parade gets underway at 5:00 pm. If you are going to be on the Vineyard, you may want to contact the Edgartown Board of Trade for the exact parade route so you can arrive early to stake out a good place to view the excitement. The fireworks will begin on Edgartown Harbor at 9 pm. The Provincetown Parade will step off at exactly 11:00 am and is nothing short of spectacular. It’s worth the trip to the end of Cape Cod to see the fabulous floats as they careen down Commercial Street. Fireworks will explode at 9:00 pm on Provincetown Harbor. Charlie and I will be front and center on Main Street in Sandwich to view the “Spirit of Sandwich” parade as it passes the Hoxie House and enters Town Hall Square. Charlie never misses his favorite 4th of July tradition of Strawberry Shortcake offered at the First Church of Christ following the parade. We end the evening listening to Dale and the Duds at the band stand on Shawme Pond. We always get a “bang” out of the boat parade on the pond…an unforgettable experience. Maybe we will see you there. Full details on the festivities will be available at local Chambers of Commerce.